How to promote a website in Russia using Direct.Yandex? Experts from Promodo are preparing to publish a comprehensive guide to promoting websites in Russia and post-Soviet countries. Below we provide an excerpt from this guide, dedicated to the contextual advertising system Direct.Yandex. Yandex, formed back in 1997 in Moscow, is the leading company on the Russian search market and owns around 50-60% of the search market (as of October 2012, Yandex owned 53% of the market, according to LiveInternet). Yandex has its own search driver, which is completely unlike Google, a range of special features in geo-targeting of search results and registering external links. Yandex also has a wide and varied net of various filters, which makes it more difficult to influence the search results. Yandex has its own contextual advertising system, which allows to show adverts both in the search results and in the Yandex Advertising Network (YAN) – an analogue of Google Display Network (GDN). 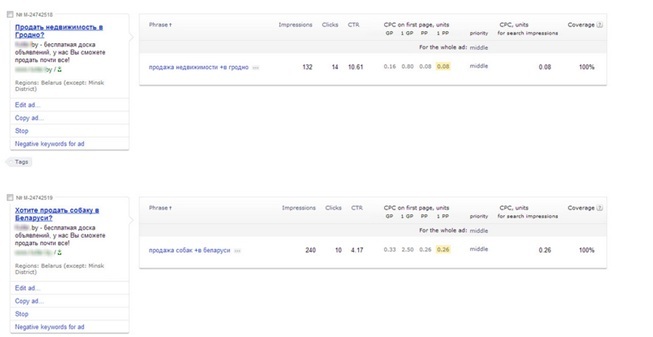 The penetration by YAN of the Russian market is comparable to Google Adwords. Account structure. In Direct.Yandex there is no concept of “Group adverts” – the ad itself plays this role. 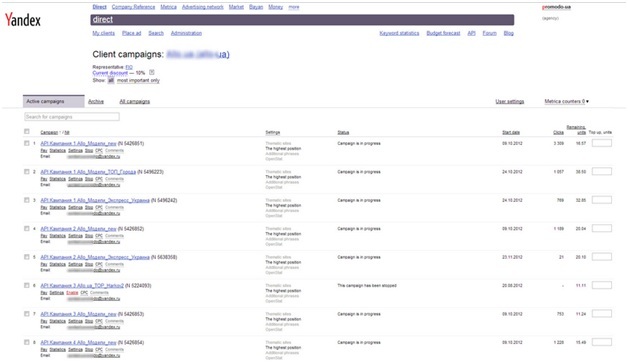 Each ad can be displayed in response to one or multiple searches and has its own target settings. The role of CTR in determining the price per click is key. Quality indicators for the landing page, and other factors, which form the Quality Score in AdWords on top of CTR, play practically no role here. Direct.Yandex has a different advertising structure. Heading (33 characters) and one line of advertising text (75 characters). It is not possible to set a budget limit in Direct.Yandex. In other words, it is very easy to spend a lot more than you had planned. 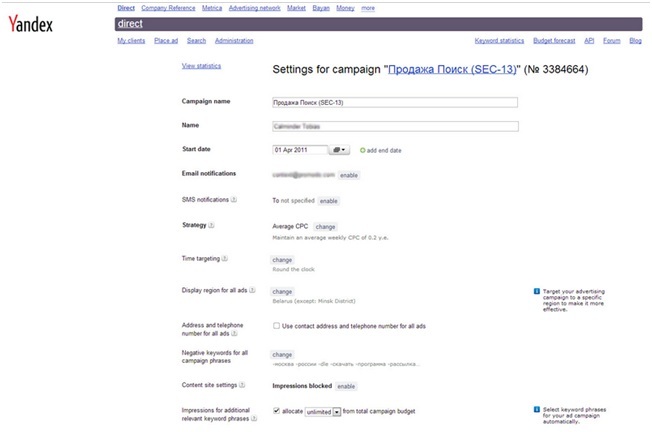 Budgeting in Yandex is based on each individual campaign and is conducted by regularly adding funds and redistributing the money at a later stage. For example, we have two campaigns: “Campaign A” with a balance of 100,000 rubles and “Campaign B” with 10,000 rubles. You can transfer 40,000 rubles from the balance of “Campaign A” to the balance of “Campaign B”. Often, a blank inactive campaign is created for the purpose of managing the budget, which is credited, for example, with the amount of the monthly budget. Afterwards the money in this blank campaign is redistributed to active advertising campaigns. There is no universal budget limit – only the money on the campaign’s balance sheet. Direct.Yandex is not integrated into Google Analytics straight away. It is necessary to mark the links first. Yandex has Yandex.Metrics (analogue of Google Analytics), which has a range of unique functions. For example, you can watch a video representation of visits to your site, including pages visited and mouse movement. The Yandex Advertising Network (YAN) does not facilitate graphic advertising. This massive disadvantage makes it more difficult to conduct branding campaigns in Direct.Yandex. There is also no way to set up remarketing. Direct.Yandex uses a different format for types of key word matching: !firstkeyword !secondkeyword – to create a phrase match and “!first keyword !secondkeyword” – to create a direct match. Prepositions are filtered out unless there is a “+” placed in front of them. Direct.Yandex allows you to set “advertising strategies” – for example, “To Keep Special Positioning” (1st place in the list of adverts). Yandex has its own version of AdWords Editor, but it is still a very new product. In order to conduct medium to large advertising campaigns special software needs to be developed. Yandex offers a discount to authorised agencies. In other words, if you are using the services of an agency which has been authorised by Yandex (such as Promodo), you will not pay anything on top of your budget, since the agency receives its remuneration from Yandex. Yandex has its own contextual advertising system Direct.Yandex, which bears a range of significant differences to Google AdWords. The impact of factors other than CTR on the price per click is minimal. The Yandex Advertising Network (YAN) has no less penetration than Google Display Network. Yandex pays a commission to advertising agencies, so when using an authorised agency for contextual advertising, clients most often do not pay the agency anything for the service.